I’m prepping the upcoming delivery of the “What’s New in VMware vSphere 4” training course. I decided to migrate the existing virtual adapters like the kernel port group and the service console port group from a vNetwork Standard Switch to a vNetwork Distributed Switch. I also switched over the virtual machines by configuring virtual machine networking on a vNetwork Distributed Switch. This is a short walk through from the ESX configuration guide. Configuring a vNetwork Distributed Switch - Use the Create vNetwork Distributed wizard to create a vNetwork Distributed Switch on a vCenter Server datacenter. Once you have created a vNetwork Distributed Switch, you can add hosts, create dvPort groups, and edit vNetwork Distributed Switch properties and policies. Add a Host to a vNetwork Distributed Switch - Add a host to a vNetwork Distributed Switch from the networking inventory view of the vSphere Client. Add dvPort Groups - A dvPort group specifies port configuration options for each member port on a vNetwork Distributed SwdvPort groups define how a connection is made through a vNetwork Distributed Switch to a network. Configuring vNetwork Distributed Switch Network Adapters - The vNetwork Distributed Switch networking view of the host configuration page displays the configuration of the host’s associated vNetwork Distributed Switches and allows you to configure the vNetwork Distributed Switch network adapters and uplink ports. 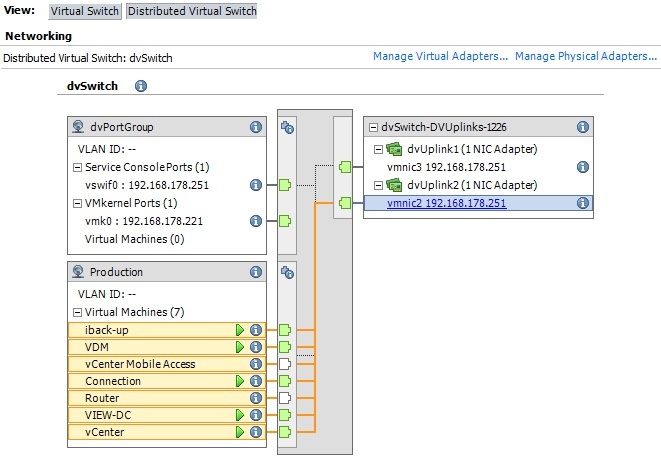 Migrate an Existing Virtual Adapter to a vNetwork Distributed Switch - Migrate an existing virtual adapter from a vNetwork Standard Switch to a vNetwork Distributed Switch from the host configuration page. Configuring Virtual Machine Networking on a vNetwork Distributed Switch - Virtual machines can be connected to vNetwork Distributed Switch either by configuring an individual virtual machine NIC or by migrating groups of virtual machiens to a vNetwork Distributed Switch from the vNetwork distributed Switch itself. Virtual machines are connected to vNetwork Distributed Switces by connecting their associated virtual network adapters to dvPort groups. This can be done either for an individual virtual machine, by modifying the virtual machine’s network adapter configuration, or for a group of virtual machines, by migrating virtual machines from an existing virtual network to a vNetwork Distributed Switch.